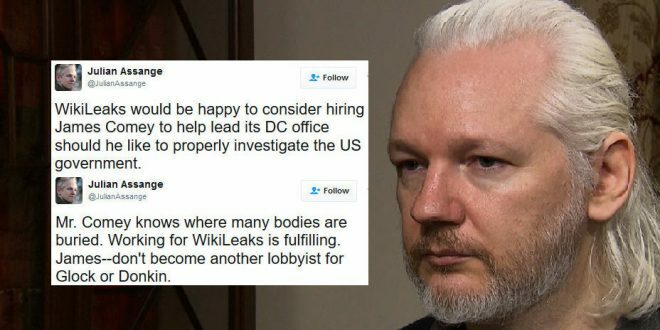 Julian Assange Offers Wikileaks Job To James Comey Because He "Knows Where Many Bodies Are Buried" - Joe.My.God. James Comey may have just been fired by President Donald Trump from his position as FBI Director, but he already has a new job offer from a surprising source: WikiLeaks. Shortly after he was fired, Julian Assange tweeted that he would be happy to offer Comey a new job if he wanted to continue to properly investigate the U.S. government from WikiLeaks’ D.C. office. The tweet was a bit of a surprise, considering that around the same time today, WikiLeaks retweeted a tweet from March 20 that called out Comey for misleading Congress about Republican emails not being released in 2016.